Polar is an old school harmonizing and pitch-shifter effect with a host of modern tricks up its sleeves. Use it for classic harmonizing, stereo-widening, and realtime pitch-shifting, or experiment with buffer looping and audio freezing to create otherworldly effects. Load up Polar in the rack, and it will instantly make your sounds wider. Introduce slight pitch-shifting to make it even bigger. Turn the Shifters to add harmonics — up to two octaves above — or radically change the pitch down to two octaves below. Finish up your patch by turning on the filter, manipulated by the built-in LFO and envelope. 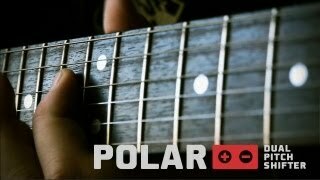 If you are a singer, producer, guitarist or remixer who is looking for transparent pitch-shifting, creative ways of turning bland recordings into wide, evolving soundscapes — or want to completely mangle a sound into an interesting mess, Polar brings all this and much more to your Reason rack.